The US defence research organisation, DARPA, aims to develop scalable, modular, and affordable approaches that can be delivered within the next three to four years for countering small unmanned aircraft systems (sUASs). Commercial-off-the-shelf UAVs such as those developed by Chinese company DJI, have been adapted by terrorist organisations such as ISIL to carry explosives to attack Iraqi and Kurdish forces in Iraq and Syria. A DJI drone operated by a photographer also reportedly landed on the UK Royal Navy's new flagship aircraft carrier, HMS Queen Elizabeth. According to reports, the photographer was forced to land his drone on the carrier—which recently docked at Portsmouth Naval Base for the first time—due to strong gusts of wind. But no one on board the ship was any the wiser, according to reports. The US is so concerned by the threat posed to military personnel, vehicles and installations by small UAVs that it recently expedited the development of counter-sUAS capabilities and their near-term introduction to the field. DARPA awarded Phase 1 agreements for its Mobile Force Protection Program (MFP) to three teams, led by Dynetics, Saab Defense and Security USA and Syracuse Research Corporation or SRC. MFP aims to counter the proliferation of sUASs, including both fixed- and rotary-wing aircraft. SRC has developed a counter-UAS technology called Silent Archer, which is designed to detect, track, classify, identify and disrupt low, slow and small unmanned airborne threats. “The three teams we’ve assembled have innovative ideas for a versatile, layered defence system that could protect convoys on the move from multiple small unmanned aircraft systems in real time,” said Jean-Charles Ledé, a programme manager in DARPA’s Tactical Technology Office (TTO). To help speed development and facilitate interoperability of MFP’s capabilities, DARPA selected the US Army’s Maneuver Aviation and Fires Integration Application (MAFIA) service-oriented architecture as the common framework for the data-fusion engine, decision-aid algorithms, and user interface, as well as the backbone for the teams’ command and control (C2) software. Already fielded by several Defense Department (DoD) programs of record, MAFIA supports multiple operating systems and provides services, libraries, common applications, and a software development kit for performer integration. These features will facilitate creation of MFP’s envisioned plug-and-play system capable of integrating new sensors and emerging technologies. The MFP program incorporates three phases punctuated by open-air demonstrations involving increasingly sophisticated threats and scenarios. The goal is for the technology demonstration system to show initial functionality at the end of Phase 1 and progressively improve, culminating in a full-capability demonstration on a moving vehicle or vessel by the end of Phase 3. At the conclusion of each open-air demonstration, DARPA plans to offer the Services and other US government agencies, the opportunity to fund extended field evaluations of the current technology demonstration system. DARPA’s goal is to develop the interim versions and the final prototype system to meet the needs of a broad number of potential government and commercial users. The US Navy’s Office of Naval Research is looking to counter “asymmetric threats”, including unmanned and light aircraft, with directed-energy weapons, which it has made a top priority. US military bases have been given permission from the Pentagon to “shoot down” or disable any drone that violates airspace restrictions over bases and is deemed a security risk. 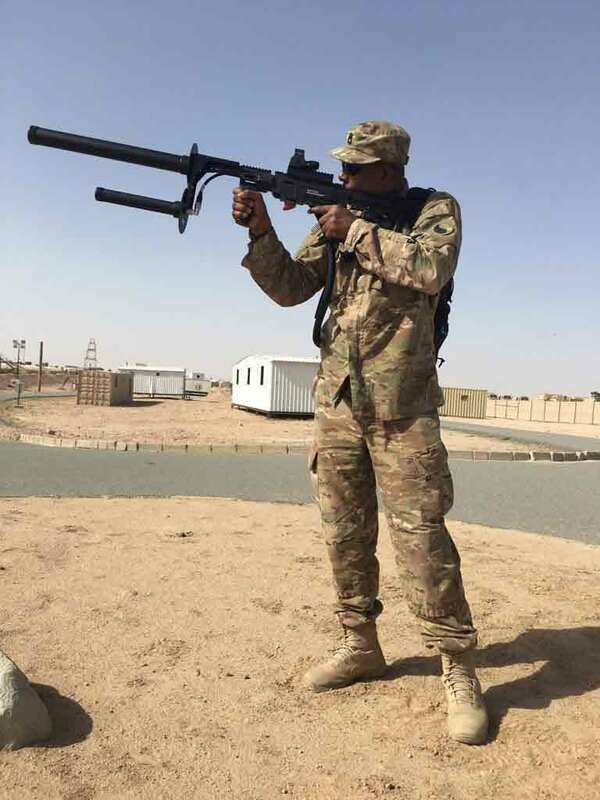 US soldiers have been trained to use the DroneDefender, a point-and-shoot, electromagnetic, rifle-shaped weapon that disrupts communications between a remote-controlled drone and its operator. The system is considered a safer and more accurate alternative than shooting drones with a rifle.